I’m embarrassed to admit this, even to myself…mostly to myself maybe…but…I think blueberries are my all time favorite fruit. There. I said it. These little bubbly blue globes make my heart jump ever time I open the refrigerator door. The funny thing about them is that I don’t necessarily crave blueberries. 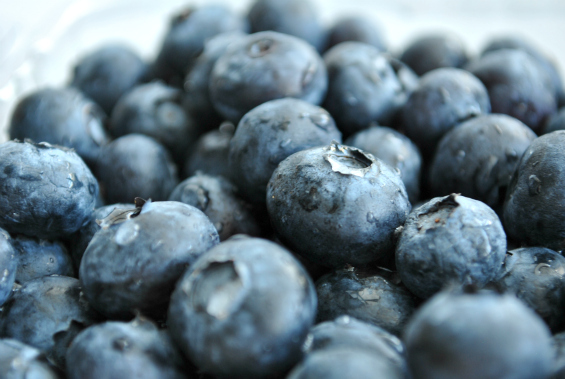 I never think, “Oohh – I wish I could sink my teeth in to a juicy blueberry right now.” Nope. But when I’m hungry for breakfast or a snack and I go rummaging into the kitchen I am always, ALWAYS thrilled when I realize I have blueberries. They just make everything better. I am currently out of them because I ate a whole clamshell full while writing this post. I guess that’s not as bad as admitting I ate a whole box of Thin Mint cookies, but it feels like it. They truly just seem so indulgent despite the fact that they show up on the healthiest foods lists time and time again. What a little winner. The problem with blueberries is that they won’t come out as a five star fruit on my rating scale and this saddens me to no end. They really aren’t that beautiful and they have no fragrance. They aren’t a fruit I’m going to talk about at a party and they won’t get headline or cover shot press. They are more like a dear old friend, a comfy sweatshirt and a creamy bowl of antioxidant rich mac-n-cheese all in one. I do love them so much. Blue-gray squatty marbles about the size of a dime with an indented “belly button”. Bright yellow-green flesh. Firm, dense and juicy with a nice tension in the skin. Sometimes has small seeds that don’t distract. Full, sweet flavor that seems thick and well rounded. Nice acidic balance. Fantastic little snacker that is easy as pie to just pop in your mouth one after the other. Every now and then you might get a tart one, but that just serves to remind you to pay attention to what you are eating and thoroughly enjoy it. We are at the very beginning of the season here in California, so for most people you probably won’t see them in your markets just yet. Don’t settle for the ones grown under weird conditions. They tend to be blandly sweet with none of the tartness to make them interesting. I imagine there are tons of varieties of blueberries out there and that they taste delightfully different, but I’ve never been privy to someone who could name the variety for me. If I ever do, of course I’ll let you know. Blueberries are my favorite fruit too! Growing up, I’d always ask for them and my mother always said they were too expensive. When I was in college, I realized that I could pretty much always spare $5 so even when they were out of season I had an instant treat in blueberries. Mmmmm…blueberries. I think I might need some to go in tomorrow’s yogurt.